It’s pretty gutsy to write (or produce or perform) a play entirely without character interaction or dialogue, in which the three characters involved offer only monologues addressed to the audience. It’s probably also gutsy to write (or produce or perform) a play in which the only thing that happens onstage all night has happened already – and the audience is none too sure what that was. Such are the challenges, frustrations, fascinations and eventual rewards of Faith Healer, written by veteran Irish playwright and screenwriter Brian Friel and currently on display thanks to Houston’s Stark Naked Theatre Company. The play is directed by former Alley stalwart John Tyson and stars himself along with the co-founding artistic directors of Stark Naked, Philip Lehl and Kim Tobin-Lehl. To say this is a labor of labor for all concerned is an understatement. Interestingly, for those who want more Irish-flavored talk after seeing Faith Healer, the company is about to launch The Good Thief by Conor McPherson, a one-man show also directed by Tyson and starring Santry Rush. 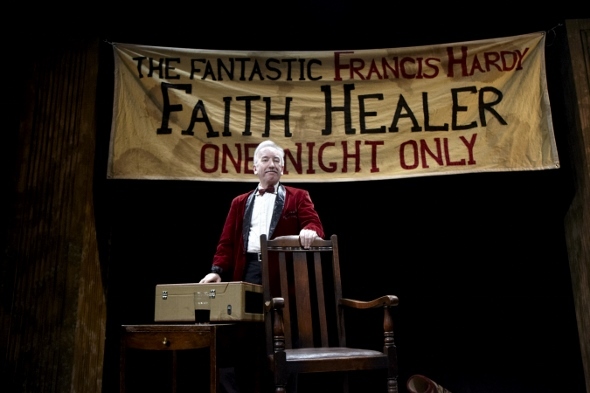 In Faith Healer, the three characters are Frank Hardy, an on-again, off-again charlatan who travels the British Isles conducting “healings” that sometimes actually work; Grace, Frank’s wife and apparently long-suffering partner in the not-very-successful venture; and Teddy, Frank’s colorful Cockney manager, who views these quasi-religious services as just another dog show, bird act or comedian to take on the road. As the monologues roll out (in no hurry, mind you), we hear from Frank then Grace before intermission, then from Teddy and Frank one final time. With halting authenticity, casual asides and bursts of deep emotion, the three talk about – something that happened. Indeed, we suspect over time that one or more of our narrators might, or might not, be already dead. The mystery is delicious right along with the lush, cascading language. Not as lyrical as we think of some Irish writers of prose or poetry, Friel nonetheless gives us a lot of words: rich, evocative, usually ambiguous, often quite funny. Things darken as we spot certain moments recurring in the different characters’ stories, clearly important, life-or-death moments, even if some of the facts are different each time we hear about them. This is, in a sense, a detective story, with audience as detective arriving after the crime and interrogating witnesses to get a handle on things. In this play, as at a crime scene, this can prove to be no picnic. Tyson retains for himself the role likely to delight most, Cockney-accented Teddy, swilling bottle after bottle of stout while intermingling tales of Frank and Grace on the road with hilarious detours into his career in smalltime entertainment. Friel was wise enough to place this entertaining monologue after the first two, when “comic relief” is certainly welcome. Tobin-Lehl gives her all to Grace, never rising from her chair, struggling with voice and especially hands to keep emotions under control, skirting the edge of some kind of breakdown that she may or may not have already had. Lehl opens and closes the show, giving voice to Frank’s own onrush of guilt, doubt and fear as the fate we slowly suspect awaits him in his Irish homeland inches nearer with each glance, each line, each word. With its shadow-filled universe crafted by set designer Kevin Holden and lighting designer Clint Allen, Faith Healer isn’t an easy night of theater. It asks more questions than it answers. And like a detective rather than a detective novel, it has to settle for an evidence table of partial truths. The current Theatre Under The Stars production of We Will Rock You, built around the music of Queen, is light years from being the worst “jukebox musical” ever created. But mostly for the flimsiness of its book, it’s hardly the best one either. As the show goes on, as shows invariably must, and moves toward those wildly theatrical Queen anthems “We Will Rock You” and “We Are the Champions,” it’s easy to forget this may not be the most engaging theater you’ve ever seen. With the care and feeding of British writer Ben Elton (who even dared take on that sequel to Phantom of the Opera with Andrew Lloyd Webber, Love Never Dies), We Will Rock You does have some kind of story. It’s the future, and everything in life is boringly neutral thanks to the cleverly named company Globalsoft. Teenagers text and tweet blandly all day and all night, with no access to the rumored rock and roll that (as we know) was always pure, noncommercial, unique and liberating, ever since the times of a mythical King who now sleeps behind the gates of a palace that, from its first mention, sounds like Graceland. There is, I suppose, nothing wrong with this fanciful tale of an even more fanciful history of rock, and it does let the cast get off dozens of clever one-liners about pop celebs from Buddy Holly to Miley Cyrus. It is less successful in providing a track on which to run the 24 Queen songs chosen for the show, a few obscure but most of the sort you’d have to live on Mars to not know. There are several affectionate references to late Queen frontman Freddie Mercury, which bring predictable cheers from a crowd gathered for this particular memorial service. 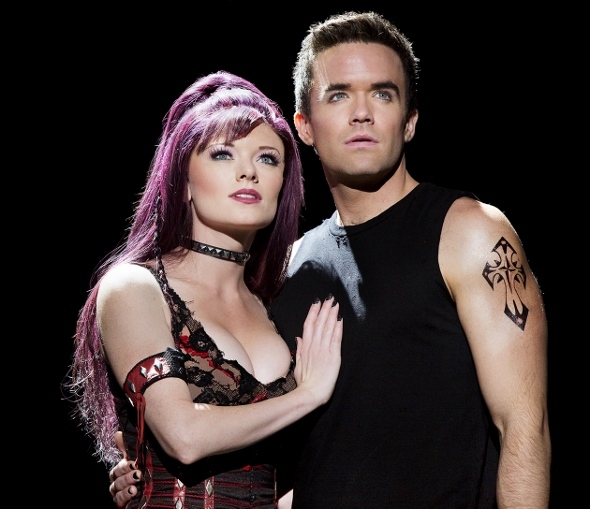 The look and feel of We Will Rock You, designed for the London stage by Mark Fisher with lighting by Willie Williams and excellent hair and makeup by John “Jack” Curtin, is kind of Mad Max meets West Side Story meets The Rocky Horror Show, with maybe a side order of Starmites. Everything is colorful and lots of fun – so much that you might expect Elton John to join Ben Elton on the show’s creative team, except that would be very different music. As it is, Queen gets a loving tribute-band rendering from a set of young rock musicians inhabiting a platform, often in the darkness, high above the stage. Like Queen’s original music, We Will Rock You’s first achievement is being very loud. Why would you want to hear these songs any other way? 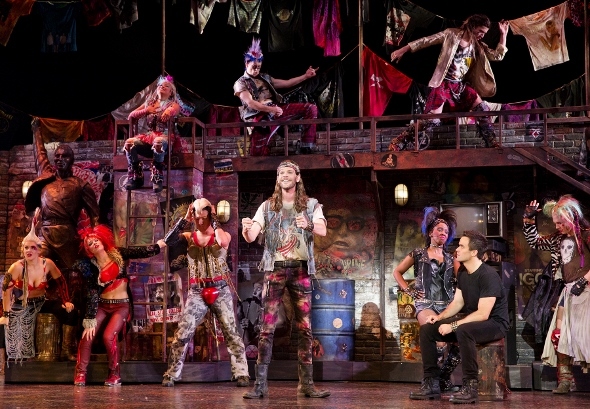 If there are failings inherent in the score – almost every song is a hard-rock anthem, perfect for the belting graduates of American Idol, ironically blamed in this show for killing “true rock” – there are no failings in the TUTS cast. Brian Justin Crum and Ruby Lewis dazzle as the romantic leads, two teens who lead a long-promised rebellion against Globalsoft – she especially with her soul-crunching, Janis Joplinesque rendition of “Somebody to Love.” Then again, Crum gets to “be” Freddie Mercury over and over, building toward the show’s big finale. He does so with careful phrasing, perfect pitch and intense physicality – just like Freddie himself used to. Other top performances include Jacqueline B. Arnold as the Killer Queen of Globalsoft (borrowing a bit from Tina Turner in The Who’s Tommy) and P.J. Griffith as her drippingly evil henchman, who shares the name “Khashoggi” with the shadowy, real-life Saudi arms dealer. It’s the kind of role Roddy McDowell would have jumped all over, if he could sing and move like he’d just escaped from the Righteous Brothers. The TUTS production of We Will Rock You, well worth an evening if you remember when, continues at the Hobby Center until Feb. 2. Quite often in life, no matter how much we know better, we hear, “Oh it was just a fairy tale wedding,” or maybe “It was like something out of a fairy tale.” And people say that, well, like it’s a good thing. 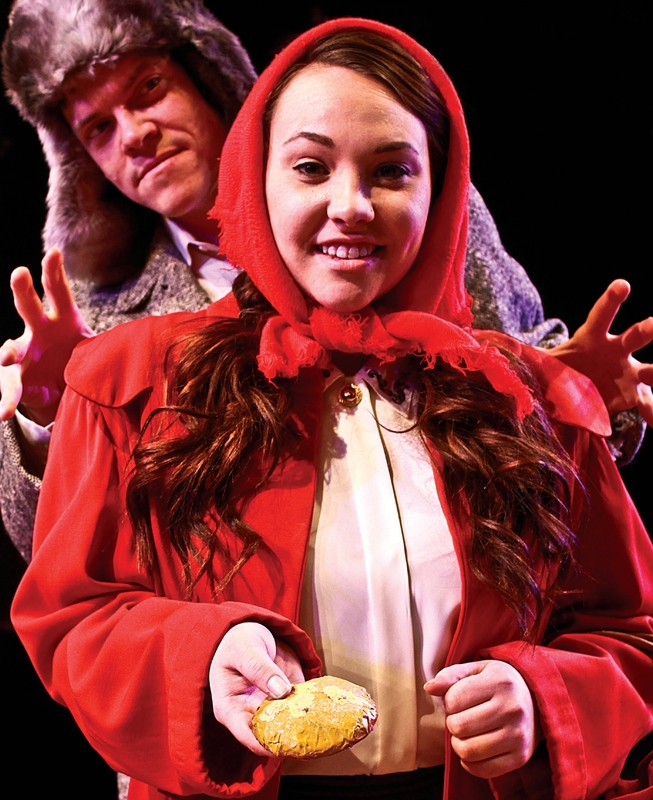 In their musical Into the Woods, Stephen Sondheim and James Lapine ponder, in each and every line and melody, what the dark side of familiar fairy tales ought to be telling us and what might happen if those fairy tales happened in our own real lives. With a lively assist from Main Street Theater, Houston can now ponder those things right along with them. The new production with a cream-of-the-crop cast of local actors, nonstop-energy direction by Andrew Ruthven and a quirky, irreverent piano accompaniment by Claudia Dyle manages to be wildly funny when it isn’t too busy being wildly sad. That’s how Into the Woods works, whenever, however and wherever it’s performed, so that this production in Main Street’s small, intimate space with audience on all sides ends up packing most of the emotional punch of a much bigger deal on, say, Broadway. Main Street and Ruthven set up one odd departure from the original, and then proceed to forget or ignore it. The program describes the show’s time period as “1944,” and then proceeds to open with a famous Edward R. Murrow broadcast from London, which would make it about 1940. After that, it proceeds to tell the mash-up story of various fairy tales pretty much as though it was any time period, or no time period. Which makes you wonder why they messed with the issue in the first place. Then again, efforts to use musicals to say something “profound” about some different time period often end up wasting everybody’s time. No one going to see Main Street’s Into the Woods is in danger of having his or her time wasted. As a Sondheim musical, there are two signatures on display here: a musical score that never falls for a familiar, cute or hummable melody – and lyrics that never met a pun or unexpected rhyme they didn’t like. At the show’s hyper-literate best, it’s like the cast is singing Tom Stoppard. This makes, naturally, for some tongue-twisters, a few of which made cast members stumble briefly on opening night. This is temporary. Mostly everybody onboard is a delight, both separately and as a spirited ensemble. Standouts include David Wald on The Baker and Amanda Passananate as The Baker’s Wife, two characters who carry a lot of emotional weight, from the show’s fascination with “getting what you wish for” all the way to guilt for actions that break hearts and/or end lives of those we presume we love. Crystal O’Brien makes a nifty, if conflicted, Cinderella, while Kasi Hollowell brings a satisfying combination of naivete and experience to the role of a Little Red Ridinghood who seems likely to end up inside of more than one wolf before she’s through. Kregg Dailey is terrific as her first Wolf, and even better as the two-timing Prince (who admits he was raised to be “charming, not sincere”). The Witch, played by Bernadette Peters on Broadway, has some of the biggest songs, and these are caressed and/or belted by Christina Stroup in a way that adds to the overall effect. Even more than other characters, her ability to carry a tune while the piano score goes off on its own is impressive. Then again, it always is with Sondheim. The show is lovely to look at, made so by Ryan McGettigan’s tight and, of necessity, efficient set design, Macy Lyne’s (fairly timeless) costumes and John Metak’s lighting. As is so often the case with Main Street, the focus is not on how much money you can trot out on stage but on how quickly and confidently you can get to the heart of the story. There is a lot of heart in Into the Woods, a very funny heart except when it’s very sad.